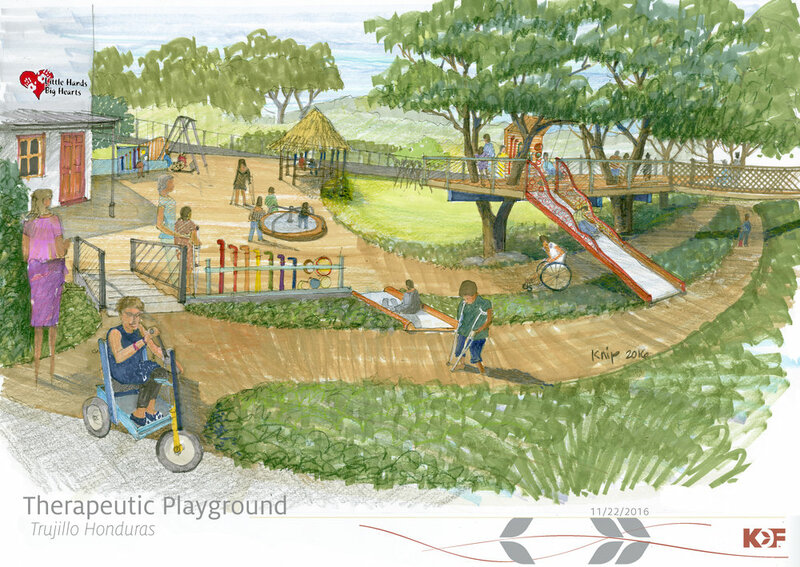 The Peugeot Center for Engineering Service in Developing Communities at Lipscomb University is currently partnering with Little Hands, Big Hearts and KDF Architecture to plan, prepare, and construct a therapeutic playground park (the “OTC”) specifically for the children with disabilities we serve. This project has been in the works for several years. An Assessment and Research Team (ART) met in Honduras during July, 2016 and, subsequently, partnered with Rod Knipper (architect, design lead) to create an initial concept. During the 2016-‘17, ‘17-‘18, and ‘18-‘19 academic years, engineering students, under the instruction of engineering faculty Dr. Joseph Tipton, have designed components for the play equipment, the bridge, and the treehouse. Meanwhile, multiple mission teams from Lipscomb have traveled to Trujillo to incrementally survey, prepare, and begin construction. The final product is anticipated to be finished in 2019, with a formalized dedication ceremony planned for October, 2019. Information provided by Joseph B. Tipton Jr., Ph.D.